One of the great undocumented Marx miniature sets ever to fill collectors’ dreams of acquiring, graces our pages this issue. 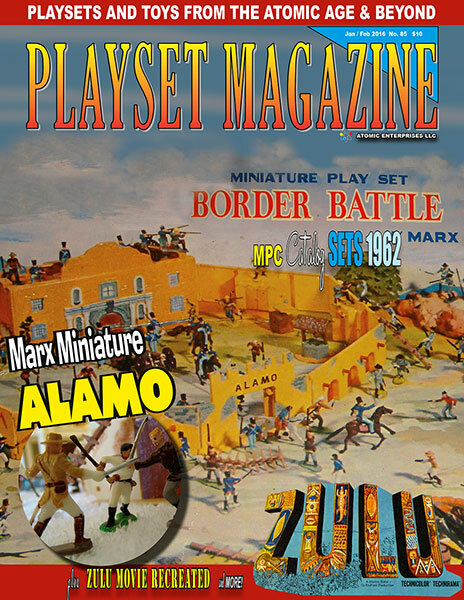 Marx “Border Battle” is a phantom, true contents previously unknown, but very official Alamo playset of the regaled Marx line. We have only seen parts up until now, and heard vague guesses as to how many figures per side, and possibly very small lots of accessories. This issue we are proud to show the set and list its complete mint contents thanks to Rick Eber! We also have the full and complete 1962 MPC Catalogs. These bold illustrations and awesome store displays will keep your attention as you search the mint sets for contents, and date some of those obscure items (like a WWI twin-engine Bomber!) you’ve had for a while. May I relay the news that the two books on the Marx Toy Company, “Marx” Toy Kings Volume 1 (1919-1954) and Volume II (1955-1982) are coming out (and may be out now) in soft cover editions. These are the same books exactly as the hard cover, but done at lesser cost. The hard covers are printed on deluxe, glossy paper with exceptional care and dust jackets -- these are just a bit less expensive to produce, and while I do not have in front of me the exact cost just yet, we expect them to be in the $50 range. They should be available at Barns and Nobel and other book stores at least by quick special order, and on Amazon.com as well as our website where we will actually have them at a lesser cost. The we have this . . . The great Broncos left guard sat on a hillside daydreaming when he had a vision: there he was looking at looked familiar to him somehow. Eventually it came to him – it looked like Natal Colony, South Africa, or as we all know it, Rorke’s Drift from the 1964 movie Zulu. That film, of course, is a longtime favorite for its many detailed and terrific battle scenes, and it dawned on Tom that he had the entire landscape he needed to recreate the setting in miniature, and that’s what he resolved to do, knowing that to do it right would take a very long time. So he began the process of collecting enough natives to make his setting look good. The process lasted seven years. He bought the figures wherever he could, allowing room for his other passions of war gaming and of course football. Then one day, not long ago, he stopped and decided to count. He had 1,400 Zulus of many different makers, enough to build the dramatic and spectacular climax of the movie. And that is exactly what he did, using about as many British defenders of Rorke’s Drift as actually participated, he built -- and photographed -- a truly one of a kind spectacle – the complete reenactment of the battle of Rorke’s Drift, including the burning of the hospital building. We are indeed proud to bring it to you this issue. We also have inside scoop on that new toy show being put on in Lafayette Indiana, The Indy Show, remarkable finds and things going on in the hobby, and ads from splendid advertisers. This issue has gone to press right on schedule as always, and will ship on the 26th of this month (December, but remember to allow for the holiday mail) and we’ll see you fresh and early in the new year of 2016! We regret to bring news of the passing of two true gentlemen, one a Marx Man from the Marx HQ offices at 200 Fifth Avenue, the other a fine collector from the very earliest days. The former is our friend and a man familiar to readers because he spent years divulging some of the secrets and inside workings of Marx, information which is contained in the Marx Toy Kings volumes of books, Mr. Sy Wane. 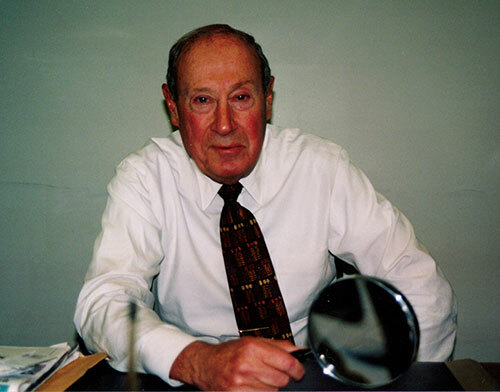 Gentlemanly, congenial and caring, Sy wanted people to know who they were inside those offices as people, human beings who made toys for a living. Because of his efforts, we have quite a good picture of the entire operation now. He entered the United States Navy and earned the rank of Lieutenant, serving in the South Pacific and ironically, at one point, docking in Hong Kong near Repulse Bay where his future boss, Louis Marx, would eventually build his fabled factory. Sy recalled that those figures painted in Germany were done by German Prisoners (they were offered the job as an alternative to sitting around all day) and is the only one who has been able to comment on the inner workings of the Repulse Bay factory where the miniature playsets (including this issues’ Border Battle) were made. I am proud to say I knew him, dined with him, and spent untold hours discussing the miniscule details of the inner workings of the firm with him. God Speed, my friend. Chuck Rastelli is a Moundville-area collector from way back. “He was one of the big three names in collecting in the early 1980’s,” says his friend and resident of Moundsville, Francis Turner. 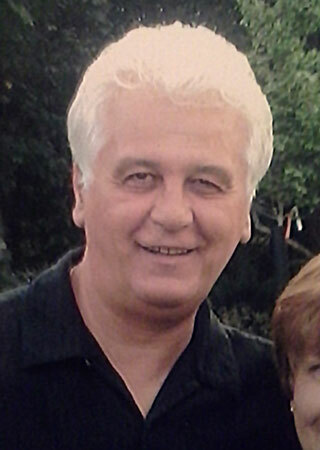 He was far too young on May 29th when he reportedly fell down a staircase at his own home, never recovering. He was born November 26th, 1950 to Albert and Helen Rastelli, a member of the Weirton Foreign Legion post (as well as Past Exalted Ruler). But he was also a very, very nice guy. Several collectors recall the night he called up and said, “I have three Wagon Train wagons with oxen. You want one?” He charged $35 for this far more valuable piece, not because he was in any way ignorant of prices. It’s because he was a very good guy, unwilling to make money off of friends. His collection has been called second to none and was very extensive in the Marx playsets area. His is a huge loss to this hobby and those who cared for him. Interestingly, Chuck worked at Weirton Steel just up the road from the Marx plant at Glen Dale, a steel plant that made the steel for use as tin lithographed buildings, cars, and trucks of every description. Of course, Chuck was too young to have been there back in the day, but he was gainfully employed at a place of Marx history. We are going to miss Chuck,’ and we salute his generosity, and as one of the original founders (he’s have laughed that off, but he was) his deep experience and sense of fraternity the rest of us sensed and built upon. God bless and keep you, Chuck.